Contrary to my expectations, this is not the Zooey Deschanel show. Because that is what I thought it would be when my friend told me about it. 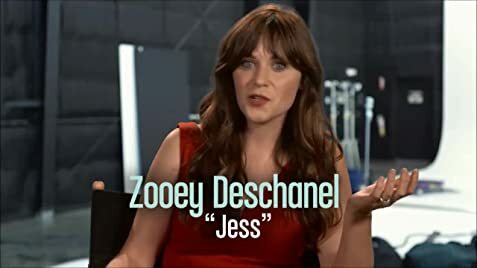 I mean, the premise of this show is that she - Zooey Deschanel - plays a bubbly, quirky-but-cute girl who moves into an all-guys apartment. Now, that's the same character she plays in every film and every series she's ever been in. It's also the same persona she uses when she sings in her band, or gives interviews, or (I imagine) blogs about baking Dr. Seuss-themed cupcakes for a company of lumberjacks. Don't get me wrong - it works. For me. On so many levels. But the problem is that she is just so aware of it. She's a dazzling indie girl with a brain and a body, and my god does she know it. So a show completely focusing on that would be unbearable. But surprisingly, this show isn't about that at all. It isn't even really about her character that much. Most of the comedy comes from the male characters, who are played by non-famous and extremely talented actors, and who find themselves in situations which as funny as they are fresh and relatable. So, to reiterate, this is not a show about Zooey Deschanel. This is a show about life as a twenty-something in the twenty-first century. It's Friends except not set or made in the nineties. It's great and it makes me laugh a lot. And I highly recommend it. Nick Miller: Jess has absolutely lost her mind. Jess: I have not lost my mind! I'm just scared.